One of my favorite YouTubers, Cannot Be Tamed, recently started doing a countdown of her top 100 games. I thought that sounded fun, so here's my own list! My criteria for this list is simply based on how fondly I remember each game. No particular consideration is given to how influential a title was or how much I think others would like it. Older games almost certainly do not hold up to their rankings here! I value them greatly because I first encountered them when the world was young and full of possibilities. Conversely, since I'm evaluating these from the perspective of my feelings in 2017 and not at the time of play, some games that I greatly appreciated but have since soured on are ranked lower or missing altogether. The various Bioshock games are probably the main example here. I didn't have any particular cutoff for eligibility, but was a bit more conservative about recently-played games. The Cat Lady and Dreamfall Chapters will probably make the list after they've had some more time to percolate. Expansions, DLC, mods, and remakes all contribute to the base game's ranking. So, for example, Baldur's Gate includes my experiences with the vanilla game, the modded game, Tales of the Sword Coast, and BGEE. The only exception is when an expansion or mod takes the form of a standalone game that is not linked to the base game. Each entry in a series is ranked independently of one another. Exceptions were made in cases where the entries all shared similar mechanics and story and blur together in my mind - this includes most rhythm games as well as Katamari. This list is ranked, but just as a snapshot in time. It's really hard to compare games, particularly across genres. All of these games are good, even #100! I'm sure I forgot major titles. Whoops. I may or may not revise this list, but it isn't intended to be a living thing. Peak TV continues apace. I have more shows on Netflix that I want to see than I have time to watch, let alone the terrific shows on other networks and platforms. I haven't even picked up HBO yet, so I'll probably end up binging Silicon Valley after Game of Thrones starts up again. Love. I mentioned this briefly before, but the second season was excellent, and tonally unique. It's terrific at surprising in unexpected, quiet ways: situations that seem to be written to explode instead quietly subside. It also deserves special credit for making such incredibly likeable flawed characters. Master of None. Another second season, and a close spiritual twin to Love, tackling some of the same subject matter. Dev's journey is excellent: he's searching for love, but really searching for purpose and fulfillment, and while the former project has plenty of setbacks the second one is continuing very well. The second season felt a little less issue-oriented than the first; it doesn't hit as directly about concepts of race and feminism (though it does have a terrific take on religion). But its character development is even stronger, both with the new and returning characters. Archer. I'd fallen way behind on this and am still catching up. It's really smart of the creators to keep reinventing the show's conceit: animated comedies inevitably start getting stale around this point, but the frequent changes in location and storyline have kept Archer fresh and surprising, even while keeping the exact same cast and general sense of humor. Better Call Saul. No, not the third season, just belatedly catching up on the second season that's on Netflix. So good! Has there ever been a prequel that's this long and this closely linked to the following show? There's a fascinating inversion of the typical process for story development: usually tension is built by withholding information and causing viewers to wonder where the story will end. In BCS, though, we already know where things will end up, but that makes things even more tense, and we're constantly wondering when the other shoe will drop, how it will end up where it's going. The cast was already terrific in the first season and is even better here, with Kim Wexler getting particular props as she navigates the narrow space between what her heart wants and her determined sense of decency and honor. Unbreakable Kimmy Schmidt. Gosh, I like this show so much. Daveed Diggs is absolutely incredible, and used in a really unexpected and delightful way. I'm impressed at how the show continues to honor the trauma of Kimmy's abuse, while not shackling her to it: she can be an incredibly fun, bubbly, optimistic person who rises above but is not defined by (and clearly does not want to be defined by!) her past. This season doesn't have quite as strong of an ending as the first two, but I thought the season as a whole was just as good. I don't like the phrase "guilty pleasure," so I'll just note that I really enjoy Supergirl. If you kind of squint, it looks a little like Buffy the Vampire Slayer: A young blonde woman with incredible powers has an ongoing duty to save the world, but is much more challenged by navigating her social circumstances than by fighting monsters. It definitely isn't a clone - Kara doesn't have any of Buffy's reluctance and is a lot more comfortable in leadership roles - but it does carry on many aspects that I'd missed from that show. Heh... I was just about to praise its mythology, but of course that mythology is the DC Comics mythology and not an original creation. I haven't watched any of the other DC TV shows, but I absolutely love the tone of Supergirl in contrast with the movie universe of Superman and Batman: it isn't fluffy, but it also isn't relentlessly grimdark. Supergirl faces scary situations, but she does so in order to save a world and people who she cares very deeply about. Speaking of which, the relationships in the show are terrific, another Buffy-esque element, with a very strong supporting cast and believably evolving relationships. Alex Danvers just might be my favorite character on television at the moment. And that isn't touching on any of the great standup or movies... I have to say, Netflix is probably the best entertainment dollar I spend. I've been thinking a lot lately about ideas: how they are created and transmitted, accepted or rejected, absorbed or inverted. It's been weighing on my mind for a few years now, and has seemed increasingly urgent in our current political and cultural environment, with massive war camps drawn up and each side not only disagreeing on policy, but not even sharing the same facts from which to debate. In times when the stakes feel incredibly high, it's natural for every person who cares to say, "I need to do something!" But what, exactly? With the rise of the Internet and social media, people are naturally inclined to spread their beliefs and message online. But this seems to be more or less useless. I don't think I've ever seen anyone who has said "I used to believe in X, but then a stranger online yelled at me, and now I believe in Y instead." That isn't to say that online discourse doesn't have an effect. I think it can be effective in suppressing the expression of dissenting opinions - which sounds bad, but isn't necessarily. (If people know that they will be slapped down for hate speech on a particular forum, they're less likely to abuse other ethnicities, regardless of their personal beliefs.) Conversely, echo chambers can motivate people, making them more focused on their cause and more likely to take offline action. That might be good (donating to charities, voting) or bad (doxxing, bomb threats, murder). And, if you're lucky enough to find someone who hasn't yet formed an opinion, you may have a shot at convincing them that you're right. But, as far as actually changing minds? It seems hard enough in the offline world. As human beings, we tend to stubbornly adhere to our world-views: we accept all evidence that supports our positions, and argue against or discredit evidence that challenges it. There's a reason people don't discuss politics in social settings: not only do such conversations get heated, but it tends to be very unproductive. And online, it's far, far worse. We can easily retreat to our bubbles and mock those on the other side... and everyone else is doing the same, or staying out of it altogether. So, what can be done? The best solution is real-world experience. Not words, but actions. Actually changing your environment, living side-by-side with someone else, seeing problems and solutions with your own eyes. This will necessarily be anecdotal and isolated, but it's also real, and as living creatures we viscerally respond to our lived environments. While I didn't appreciate it all that much at the time, I think one of my more formative experiences while growing up as a white suburban boy was a church youth group trip to Chicago, where we lived in the inner city and worked at public-housing projects. (And this was the grim 90's Chicago of Cabrini Green and Robert Taylor, not the shiny 21st century Chicago of Millennium Park and Navy Pier). The things we experienced were very different from our daily experiences back home, but what was far more important were the commonalities: seeing the human, finding shared expressions, recognizing that despite our differences we shared much. If I hadn't experienced that then, I don't know if I ever would have; and how would I now filter discussions about poverty, race, justice? And there are so many other things I haven't experienced: life abroad, in marginalized communities, etc. Given all the above, I, personally, have been feeling pessimistic and unmoored. I've been donating money, which is useful; I've been attending rallies and marches, which lifts my spirit; but ultimately, the project of America will require changing minds, and I don't think either of those activities really helps with that. They can win battles, of defeating bad policies and electing good leaders; but the tumor in America will still be there, poisoning the body, pulsing out hate and ready to metastasize. So, how to change minds? I think that there's one other option, which is the weakest one but one that lies within my grasp: creating art. When people are presented with Discourse, their brains switch into combat mode: ready to fight for their side, defeat the arguments sent their way, marshaling their defenses and allies. But art bypasses all of that. When someone is watching a well-made movie, or reading a novel, or playing a video game, or listening to music, or looking at paintings, they are engaging with it as a creative work, not as a piece of polemics. Any messages, viewpoints, values, are transmitted as the artwork is consumed, and have a chance of lodging in the brain, another vector through which ideas can travel. I've recently heard some people, who I respect, make claims along lines like "All art inherently increases empathy and is helpful." I don't think that's true. Art can transmit ideas, and artists are often compassionate people, but it can absolutely be used to transmit ideas that are incorrect or evil. The example that immediately springs to my mind is the TV show "24", which poisoned the American mind and led to disastrous policies that have damaged the world. And the relentless adoration of violence in our media prepares us, both as individuals and as a society, to consider it a natural solution to problems. So, making art doesn't necessarily help by itself, but it does provide a narrow channel that has a chance at changing a handful of minds. If someone is a liberal, then they aren't likely to spend their time reading right-wing thinkpieces; but if a conservative enjoys fantasy, then they may spend hours reading fantasy novels or watching fantasy movies, and along the way they might absorb a couple of perspectives that they otherwise might not have encountered. Art can meet people where they are, and take them to new places. This is absolutely not a panacea, and honestly probably not even the best use of my time. Hundreds of hours of labor might (just picking numbers at random) cause four people to soften their views somewhat. I'd make a bigger impact by spending more hours working and directing more resources to helpful organizations. But creation is an approach that can help me feel like a more full human being, bringing one other set of gifts to the table, and possibly seeing a direct line between actions I take and small changes in the world. Waaaaay back in March, I picked up The Long Earth in a duty-free airport bookstore. It's been my background reading ever since then: I'll pick it up and read a couple of chapters when I'm able to divert my attention from encroaching armageddon. It's been a good read: fun and interesting, weighty without being particularly dark. 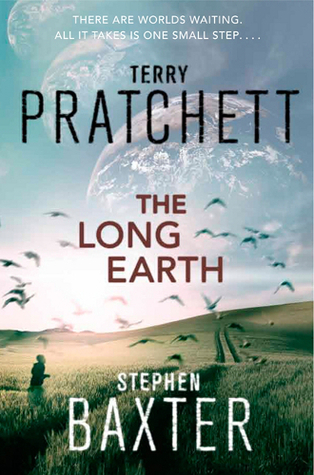 It was written as a collaboration between Terry Pratchett and Stephen Baxter. To be completely honest, I couldn't detect a whole lot of Pratchett in here. It would have been written after his illness had advanced, and I suspect that Baxter performed most of the actual writing duties. In comparison to, say, Good Omens, you don't get much of the Pratchett spark here. When it does shine, though, it is brilliant: one particular pun near the end of the book made me want to howl with rage and delight. Even if it doesn't feel especially Pratchett-y, though, it's still fun and well-written, taking a really intriguing premise and getting a lot of material out of it. The "long earth" of the title is the discover of a seemingly infinite number of parallel Earths. The basic concept has been done many times in a variety of media: slightly different events in the past have led to different versions of the world. So some Earths are frozen snowballs, others are exceptionally fertile, many have species of animals that look different from our own. The unique and exciting thing about this story, though, is its democratic orientation. In every other story of this kind I've read, it's just a small group of people who are able (or forced) to move between worlds. Here, practically everyone has the capability. Once "stepping" is discovered, something like 90% of the earth's population can just choose to travel to another world and start another life there. As with a lot of good science fiction, the authors diligently work through consequences of this scenario. What happens to Earth's economy when anyone can simply leave, pursuing a world of plenty instead of laboring in a menial job? What status do nations have across universes? How do the people left behind on the original Earth ("Datum") feel about their lot and those who have moved on? This is the first book in a series, and it seems fairly obvious that the union of Lobsang and First Person Singular will be a major plot point in future novels. Reading about FPS vividly reminded me of Leviathan in Robert Anton Wilson's Illuminatus! trilogy, which was an idea that fascinated me and I don't think has been explored much elsewhere. There are so many fundamental things about life that we take for granted which seem like they could have very easily gone in different directions, and FPS/Leviathan seems a particularly believable and intriguing example of an alternative design. So, yeah: I liked this book! It doesn't fully scratch that Pratchett itch, but it was still a good read, and I expect that eventually I'll read the remaining entries in the series. Always go with your first idea. Start writing as soon as possible: Preparation is the enemy. As soon as you realize that something isn't working, ignore the problem and press on. If a passage seems weak, fix it by adding more words. Never show your work to others.